As a settled community, Parkesburg predates the Revolutionary War. First known as the Fountain Inn (the Fountain Inn, circa 1734, still stands today as a private residence), the area was inhabited by settlers of predominantly Scottish-Irish descent, who migrated north on the Gap-Newport Pike (now Route 41), from New Castle, Delaware. John G. Parke, from whom the Borough got its name, was a noted politician from a prominent family in the area. A relative, General John G. Parke, served during the Civil War and played a prominent role in such campaigns as Fredericksburg Vicksburg, the Wilderness, Spotsylvania and Petersburg. Throughout the nineteenth century, the small community expanded rapidly. The prominent Fountain Inn ceased operation as a tavern around 1836 and became Parkesburg's first Post Office. As the population of the town grew, many new industries were attracted there. Among these were the railroad workshops of the newly formed Philadelphia and Columbia Railroad. The tracks of the Philadelphia and Columbia were laid to Parkesburg in 1831. A state funded venture, this railroad was coordinated with an extensive canal system. 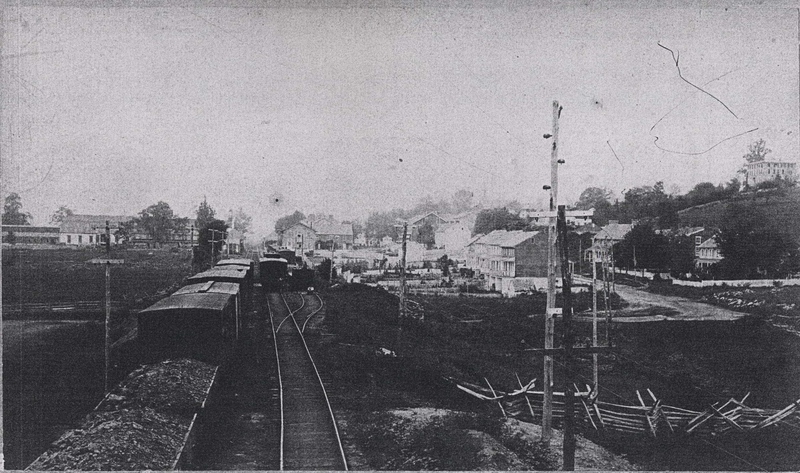 Since Parkesburg was located at one of the highest points along this railroad, it was decided to situate the repair shops there. Good fortune, however, was not to follow the Philadelphia and Columbia. By 1857, the system had gone bankrupt, with portions of the canal, it was sold to the new Pennsylvania Railroad. The rapid industrial expansion of the Midwest, and the increasing migration of settlers to such large urban centers as Pittsburgh, Cleveland, and Chicago, enabled the Pennsylvania Railroad to develop rapidly. In 1861, this rapid expansion prompted the railroad to relocate their shops further west to Harrisburg. Still later, the shops were moved to Altoona where they soon gained the reputation as the world's largest railroad repair shops. Historians claim, however, that it was while these shops were in Parkesburg that standardization-the basis for mass production-first got its start. It was during the early part of this decade that educational institutions began to spring up in the Parkesburg area. Among the most notable of these was the Parkesburg Academy (later renamed the Parkesburg Institute). Chartered in 1858, a Professor Woodruff was named the first principal of the Academy. Fostering an idea which was years ahead of its time, he favored a system of coeducation for the Academy. This brazen idea, however, was rejected by Mr. Woodruff's peers and the Professor was soon out searching for another job. The Parkesburg Academy remained male oriented for some time to come. In 1872, Horace Beale moved his Iron Works from Hibernia to Parkesburg where they became known, appropriately, as the Parkesburg Iron Company. This move coincided with the secession of the Borough from Sadsbury Township. Act 193 of the Pennsylvania Legislature authorized the formation of Parkesburg Borough, and Samuel R. Parkes was elected its first Burgess. He also organized the town's first bank. The Great Depression of the 1930's brought hard times to Parkesburg, as it did to much of the rest of the country. With the closing of the Iron Mills, many of the Borough's residents were out of work until they found employment at Lukens Steel in Coatesville. Today, Parkesburg is a center for industries with local as well as national reputations. The Borough is served by modern sewage and water facilities, and the Parkesburg Volunteer Fire Company has provided dependable fire protection for the Borough since its founding in 1894. Read "Parkesburg - Our Town History 1681 to 1972" by Marris Mullen, long time borough secretary and history teacher.